"I first learned to fish for Salmon in England, on the River Severn. Twenty six years ago I moved to my father's home country of New Zealand. He introduced me to trout fishing and I have enjoyed fly fishing on the Tongariro and neighbouring rivers ever since. Along the way I have introduced many friends to the wonderful art of fly fishing. My loves are family, trout fishing, friends and meeting people and when I found the opportunity to combine all four in an idyllic setting of tranquility, natural unspoiled beauty and private luxury accommodation I grabbed it with both hands. Just one minute's walk to what is arguably the most famous of New Zealand's trout fishing pools, the "Major Jones Pool", and Tongariro's equally famous and challenging rainbow trout, our lodge's natural beauty can be viewed from the sunny upper deck throughout the year. The incredibly powerful Tongariro River is banked with mature native trees and the music of the river mixes with that of bird song to provide what I consider to be an environment close to perfection. 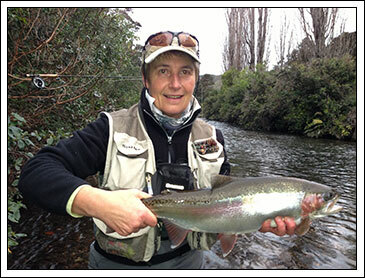 I am proud to share this haven with visitors who appreciate fishing and relaxing in a pristine environment and offer the Turangi Trout Lodge as my special place for you to enjoy." Turangi Trout Lodge uses SSL, does not store credit card details, and all payments are handled by a secure, PCI compliant, third party.